The vast ouvre of internationally recognized and legendary artist Louise Bourgeois, now 98, has always been personal, often autobiographical. The artist has also worked in a wide variety of media. This show of newer work at Gallery Paule Anglim, titled “Mother and Child” (on view through June 12), features both aspects. On view are sculptures, verse, gouache drawings, and prints focused on motherhood, sexuality, birthing, the female power to create, aging, and dying. With these, then, Bourgeois also continues her career-long attention to the experience of being a housewife/mother, further establishing her as one of our most important feminist artists. Bourgeouis’s work can tilt towards heavy-handedness, particularly when it engages in overly literal, sometimes gruesome, dipictions of pain and fear. That is not a problem here; in fact, quite the opposite. The gems of the show are the thirteen gouache drawings. This is particularly interesting given the imagery – graphic birthing scenes and nudes of pregnant women that depict the fetus in utero – and the fact that they are all painted in blood red on a flat white background. Crudely painted to the point of being almost abstract, with edges blurred by the watery gouache, they are approachable and, somehow, sad. They reveal themselves slowly; from the forms emerge a baby’s head from between two legs, and oversized breasts. These are solitary women, swollen and alone. Slightly more abstract, and quiet, are the two medium-size bronze sculptures. From Bourgeois’s “Echo” series, these are casts of sweaters that had been soaked and stuffed; they’re both painted white. Hinting at the human figure, the sagging, drooping forms poetically speak to emptiness, aging, and death. Intimate, shocking, scary, viseral, beautiful, Bourgeois here succeeds as only someone with years of experience at her craft and art, and a long life of intense and moving experiences fully felt, is able. She gets to you where it counts. David Michael Smith's "King George III"
From the moment I first saw SF-based artist David Michael Smith‘s work at Scott Richards Contemporary Art a month or so ago, I was smitten. 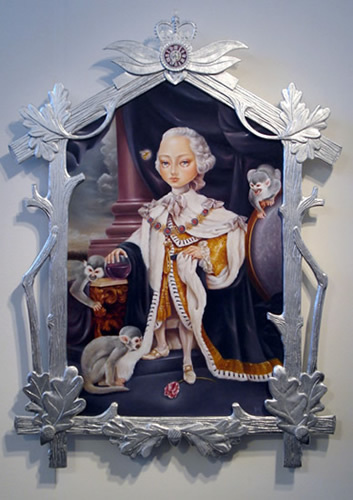 I had the chance to see this latest creation, King George III, at the SF Fine Art Fair, and I liked it so well that I was inspired to create this new section so I could talk about it: my pick of the week. Smith draws on historic personalities, pop culture, and symbolism to add rich (often creepy or dark) narrative to his beautifully rendered, almost surreal paintings. Note, for this work, he also made the frame and constructed the clock. Here is Smith’s full description of this painting as stated on gallery Website: This painting depicts King George III, the third British monarch from the House of Hanover. By all accounts a well-intentioned, pious, and judicious king, he suffered in later life from recurrent and, eventually, permanent mental illness. This is generally supposed to have been the result of the blood disease porphyria. One of the symptoms of porphyria is a purple discoloration of urine during an attack. The painting is saturated with the color purple and the glass bowl under his right hand is full of a purple liquid. The pillar behind him is made of porphyry (derived from the same Greek word, meaning “purple pigment,” from which the disease is named) as is the clock face set into the frame. I’ve included symbols of madness in the painting including a hornet and a tulip and the looming storm on the horizon. King George III kept a menagerie of exotic animals at Kew Gardens and I’ve included the monkeys as a reference to them. As his life became more and more wretched due to his illness, he lived much of his later years as a prisoner in Windsor Castle, subjected to the harsh treatment of various doctors. I imagine he could have felt quite a kinship with these creatures, ripped from the normalcy of their lives and put behind bars. One hundred black-and-white portraits, with an emphasis toward the black end of the scale, repetitively line the walls of this solo exhibition by new media Milan-based artist Davide Coltro (on view April 1 through May15, 2010). Each work measures 16-by-13 inches and is encased in a plastic sleeve; the sole break in the lineup: a screen, similar in size to the portraits, playing a random feed of hundreds of these images, here brightly colored, melding slowly into each other, one after the next. 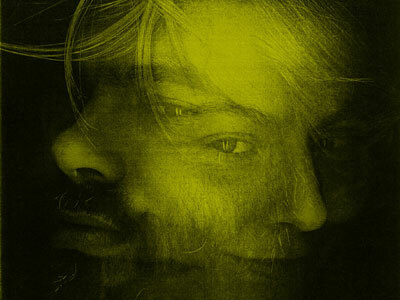 The portraits, which feature Coltro’s friends or people he’s met, were created with a standard office photocopier; the subject laid his or her head on the machine. This accounts for the mostly three-quarter or full profiles, with only a few head-on shots. The method also explains the darkness of the images and that everything surrounding the face is black. To create the continually morphing screen feed, the artist uses a proprietary algorithm he wrote, which resizes, colors, and combines the portraits. The screen recalls and further pushes the work, “[Systems],” featured in the artist’s first exhibition at Wolfe Contemporary (2007), which focused on landscape. Again, Coltro approaches a traditional genre through his lens of unique technology. While the printouts serve to support the screen module, the combination works well as a whole. While the screen steadily presents a never-ending march of faces over time, the single portraits snaking the gallery walls offer the whole crowd, all at once. And both views upend the genre: whereas portraiture originally highlighted an individual’s uniqueness, set him or her apart, these streams of faces remind us that we are one of many. The xeroxing process, which renders a visual sameness, reinforces this . So stark, unflattering, and similarly produced are the images, beauty and status become a non-factor. The end result is one of equitability and unification. The one off-putting aspect of the show is the plastic encasing of the images; wavy and reflective, it makes the portraits difficult to see. (It’s curious to learn that this display was insisted on by the artist.) But still, the show works. The flow of images is harmonious; the screen, especially, is mesmerizing. And, this is at its heart a conceptual piece; it is the idea we take with us. We are all a part of this, in it together. There’s a comfort in that. This review originally ran in art, ltd magazine. Weiwei is a conceptual artist; the greater message of his pieces is not immediately evident. Where his work succeeds then is that it engages us to the point of curiosity. The pieces on show at Haines—all recent sculpture (2006–2010) of various mediums, including porcelain, marble, and canvas packs—are pretty, sometimes luscious, and simple. They are easy points of entry to sometimes difficult subjects. 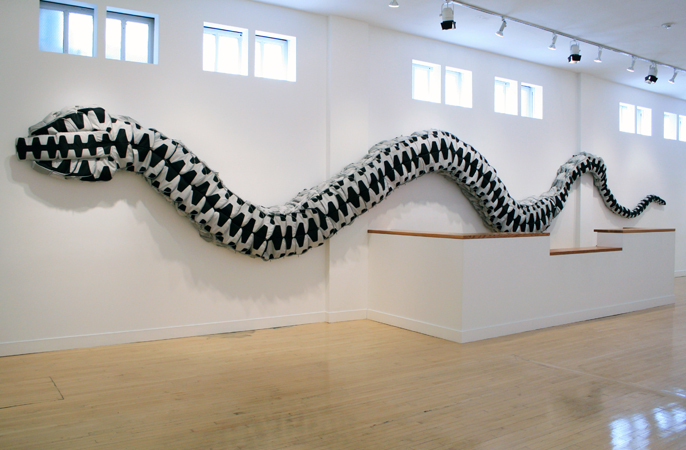 Perhaps most powerful—at almost sixty feet long, it has quite a presence—is Snake Bag, 2008, a series of 360 backpacks zippered together in the form of a serpent. The work is a memorial to the thousands of children who perished in the 2008 Sichuan Province earthquake; Weiwei holds the government responsible for the excessiveness of the death toll (it was this criticism that led to the police beatings). Kui Hua Zi (sunflower seeds), 2009, is another strong work. Comprising 550 pounds of porcelain seeds piled in a conical shape (it took twenty assistants more than a year to hand-make all the pieces), it’s a nod to the famine diet of peasants during Mao’s Great Leap Forward, which spanned 1959 to 1961. The work readily recalls Gonzalez-Torres’s candy piles, albeit appropriately relaying a slightly less generous twist. Of particular interest to the Bay Area is Owl Houses, 2010, a collection of ten hand-painted porcelain structures meant to be owl habitats. These were recently installed in the San Francisco Presidio to serve their sheltering purpose as part of “Presidio Habitats,” an on-site group exhibition that runs through May 16, 2011. This is the first major solo exhibition of Weiwei’s work on the West Coast. Go to see some lovely work, stay for the conversation. This exhibition is on view until May 28, 2010. Interact with the artist: Additionally, Haines Gallery has created an “Ai Weiwei at Haines Gallery” blog. It serves as a place where the public, artist, and gallery can interact. Questions and comments for Weiwei are encouraged; it’s a unique opportunity to interact directly with the artist. Go to: hainesgallery.wordpress.com. 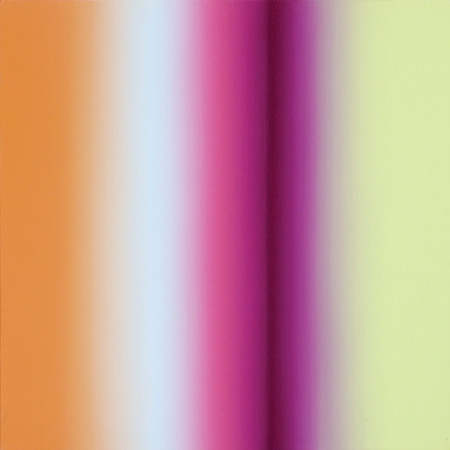 Though abstract, Dintino’s spectrum paintings each feature a distinct rhythm and narrative—a melody, he states. (He used to be a full-time musician.) 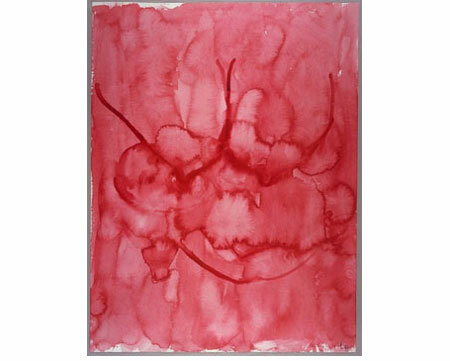 And even though there is an engaging dis-ease in these works, they are meditative. Patrick Dintino’s work will be featured in an upcoming solo show at Andrea Schwartz Gallery, in San Francisco, from June 16 – July 30, 2010. This profile appears in the May/June issue of art, ltd magazine. 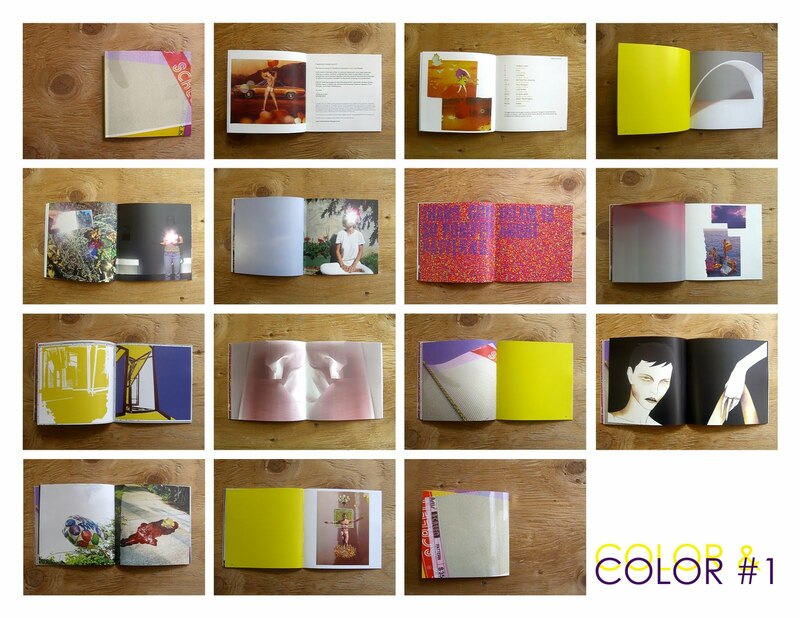 Going the DIY route and traveling in the well-tread Bay Area tradition of artist book production—a la Hot & Cold and One Artist One Book, among many others—artists Amanda Curreri and Erik Scollon (both represented by SF–based Ping Pong Gallery) recently began co-curating and co-producing the seasonal publication Color & Color. The second/Winter (CC#1) issue has just been released; it’s forty-six pages feature work by Luke Butler, Audrey Hynes, Lindsay Jesse, Cybele Lyle, Ali Naschke-Messing, Nyeema Morgan, Paul Morgan, and Marci Washington. The common theme that runs between issues is (not surprisingly) color; specifically, each issue is “guided by the duality of two thematic colors.” This issue’s colors are yellow and purple. The first issue (CC#0), released last Fall, was based on orange and blue. The publication is available in print and digitally. More information and links to acquiring one or both issues can be found at the Color & Color site. This Thursday, May 13: Vernissage, the MFA preview party and fundraiser for the SF Art Institute. Highlights include: live music by legendary Studio 13 Jass Band; guided private tours by some of the area’s finest curators (see list below); a silent auction featuring original fine art by SFAI alumni notables, including Nicole Buffett (BFA 01, MFA 04), Omar Chacon (MFA 04), Enrique Chagoya (BFA 84), and William Wiley (BFA 60, MFA 62); and the opportunity to be the first to experience the work of a next generation of emerging artists coming out of one of the nation’s most prestigious and forward-thinking art schools. The exhibition features work in a variety of media by approximately 100 graduating MFA students. Vernissage also presents the unique opportunity to meet and discuss with the artists. Additional information and purchase tickets at: http://bit.ly/cR2vp6. Curtors offering private tours: Apsara DiQuinzio, Assistant Curator of Painting and Sculpture, SFMOMA; Rudolf Frieling, Curator of Media Arts, SFMOMA; Gary Garrels, Elise S. Haas Senior Curator of Painting and Sculpture, SFMOMA; Betti-Sue Hertz, Director of Visual Arts, Yerba Buena Center for the Arts; Hanru Hou, Director of Exhibitions and Galleries, SFAI; Robert Flynn Johnson, Curator Emeritus, Achenbach Foundation for Graphic Arts, Fine Arts Museums of San Francisco; Julio Cesar Morales, Adjunct Curator, Yerba Buena Center for the Arts; Jeannene Przyblyski, Dean of Academic Affairs, SFAI; Dominic Willsdon, Leanne and George Roberts Curator of Education and Public Programs, SFMOMA; and John Zarobell, Assistant Curator of Collections, Exhibitions, and Commissions, SFMOMA.